Setting up a correct campaign starts with a few essential steps. Enter the URL of your website, as it is indexed as a homepage. 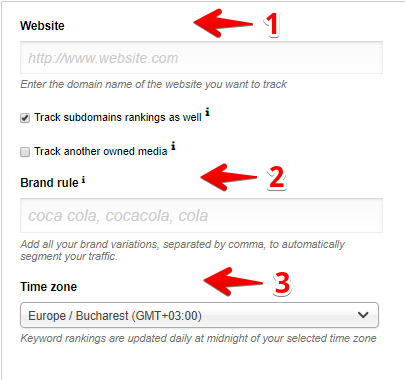 You can also decide to track subdomain rankings: tick the checkbox if you are receiving traffic data on subdomains, such as "blog.website.com" or "m.website.com" and you want to monitor their rankings as well. In case you have other owned media, you can also track them within the same campaign, depending on your area of interest (examples: apple.com and itunes.com are other owned media to eachother; amazon.com can be tracked for ranks and visibility in the same campaign as amazon.co.uk). Practically, any websites, mobile sites, blogs, stores, social media pages, apps associated to your brand could be included for research purposes in your campaign. Your target audience can reach you by being attracted to other owned property, which can be of interest in certain campaign, reports or analyses. 2. Set up a rule to filter your brand and non-brand traffic, by adding your brand name and all of its variations, comma delimited. All of the keywords added as brand names will be the basis of how we automatically identify the branded traffic and perform the brand/non-brand segmentation. Like in the example below, if you have set up "apple", "apple.com", "aple" and "aplle" as the brand keywords and their main variations, we will filter all of their long-tails (such as "apple.com support contact", "aple phones", etc.) and consider them brand keywords as well. More details on how to set your brand keywords can be found here. 3. Set your time zone. Keyword rankings are updated daily, for you to have them ready in the morning, and this is dependent on your selected time zone. 4. Choose whether you want your website tracked globally or on a specific market. Note that all keyword rankings and search volumes will be provided based on this setting. 5. Decide whether you want city-level localized search: if the campaign is for a localized business, choose the corresponding location. The ranks and search volumes will be provided accordingly. Read more about it here. Ideally, we need access to both of them, to extract the not-provided data and segment branded and non-branded (SEO) visits. Based on a "cross-matching" between the information in Analytics and Search Console, we are able to reveal the not-provided keywords and distribute traffic and conversions back into these organic queries. 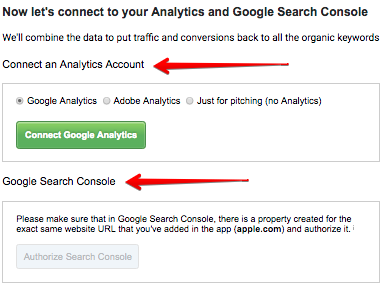 You can either connect a Google Analytics (GA) or an Adobe Analytics account. For agency clients, there is also the option of adding websites that don't require connecting an Analytics profile - what we call "pitching campaigns", which can be used for an easier prospecting. In order to connect the Google Search Console (GSC) profile, please make sure that there is a GSC property created for the exact same website URL that you've added in the platform (with/without www, with http/https) and authorize this one. If associating the GA profile is mandatory, connecting the GSC one can be skipped. Please bear in mind that, if skipped, the not-provided data and the brand vs. non-brand distribution will not be available. Based on the competitor(s) you choose here, we can calibrate the automatic keyword research and make it more relevant for your site. You need to add at least one competitor and we're also giving some automatic suggestions. In this initial step, you can only add up to 5 competitors, but you can add unlimited later and/or change them, directly in the platform. From day 1, we're tracking all of the sites that are ranking on your tracked keywords and this is why you have the flexibility of changing the tracked competitors. Using our automatic suggestions, already grouped under topics (keywords grouped by intent). You can change your keyword list at any time, to make sure you have the most relevant ones for each campaign. If you need to import your historical (ranking) data from a different tool just get in touch with us, we'd be happy to help! Once you're done with the wizard and even after we're done processing the traffic and keyword data, your initial job shouldn't just yet be considered done. We'd strongly recommend giving our Fine-tuning your campaign article a read!